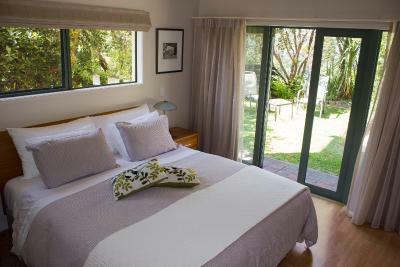 Lock in a great price for Allegra House – rated 9.8 by recent guests! Owner was lovely! Super friendly and welcoming. Went out of the way to help us book trips / tell us about the area. Will definitely recommend to friends and family! Hopefully we will be back again! Loved the location. The place was just like the pictures only better! It had everything we needed. Our hosts were wonderful. 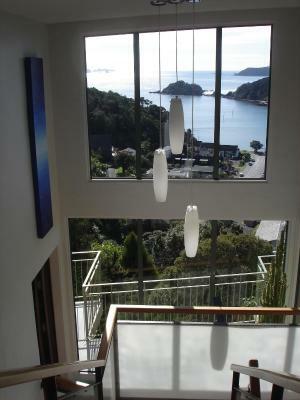 The place was exceptionally clean and the view was WOW!! Best B&B ever! 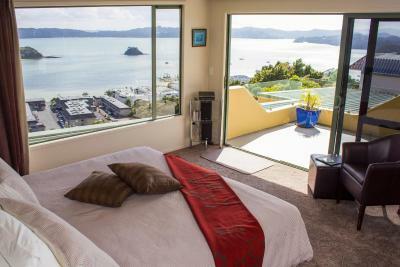 Our room was well furnished, clean and comfortable, with a wonderful view of the Bay of Islands. We could see it out the large picture window right from our bed. Britt and Heinze go out of their way to make everyone feel welcome. 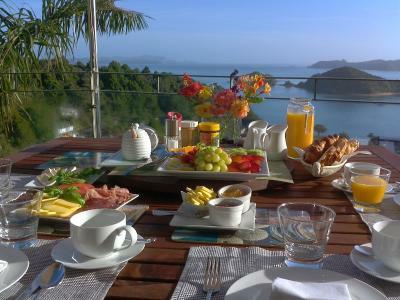 They provide delicious breakfasts either on the outside balcony overlooking the bay or in the dining room. 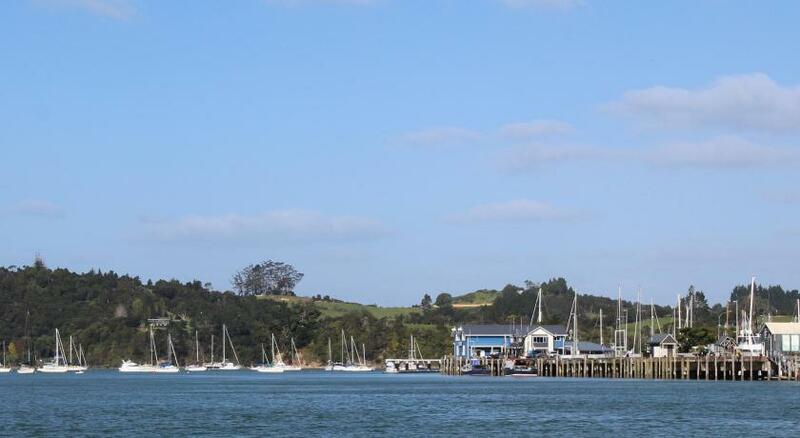 They provide lots of ideas for local sights and activities. Heinze actually drove us to Haruru Falls so we could do the walk to the Waitangi Treaty Grounds. It was a wonderfully warm experience and we would stay there again. 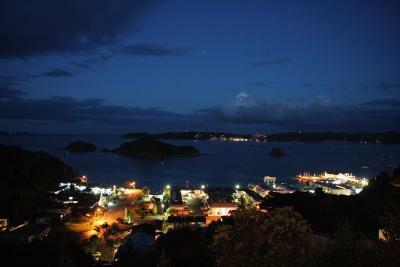 The view from our room over the Bay of Islands was sensational. Our hosts could not do enough to help with our activities and their advice was welcome and spot on. 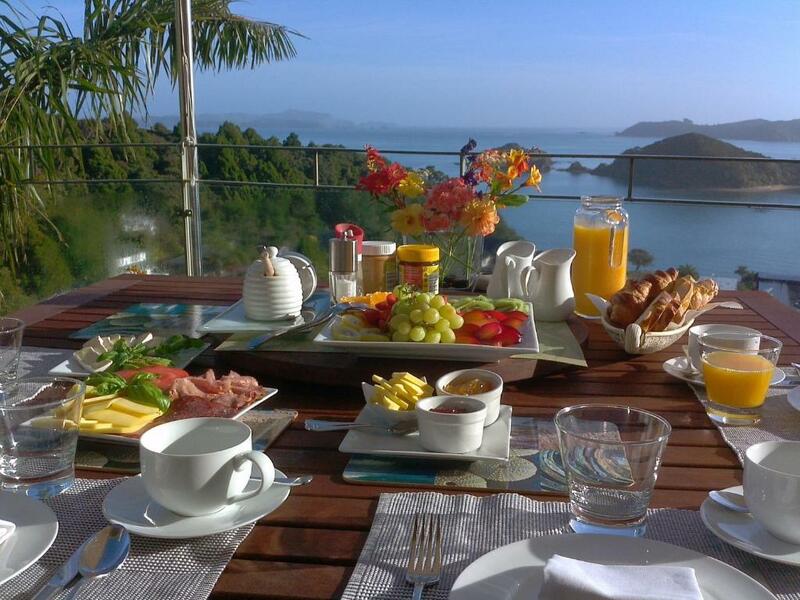 Breakfasts were just the right mixture of different things and the view again was wonderful. 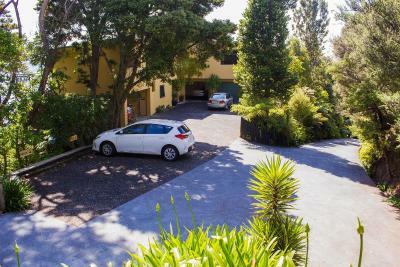 Allegra House This rating is a reflection of how the property compares to the industry standard when it comes to price, facilities and services available. It's based on a self-evaluation by the property. Use this rating to help choose your stay! 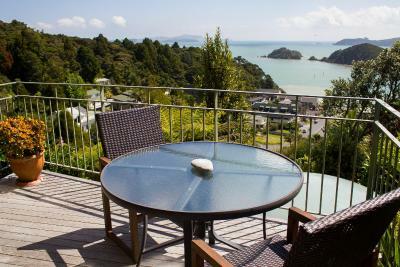 Allegra House is located up a hill from the center of Paihia, where you will find a range of shops, restaurants and the beach. 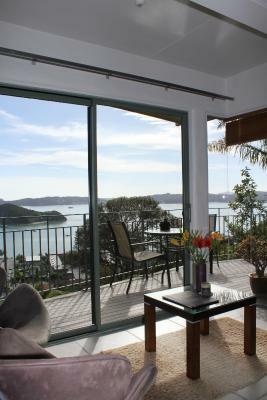 All rooms at Allegra House have spectacular sea views and space to sit outside. Air-conditioning, a TV, refrigerator, tea/coffee making facilities and free WiFi are provided. Each room has an private bathroom with a shower. 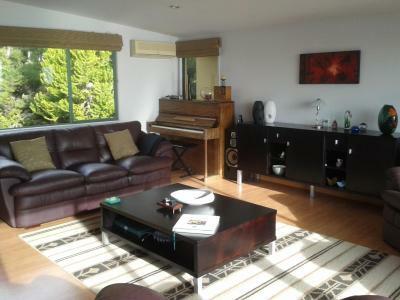 Other facilities offered at Allegra House include a shared lounge, garden, balconies, a ticket service and a tour desk. The property offers free parking and if you are arriving by bus, a pick up service from the bus stop is available, on request. 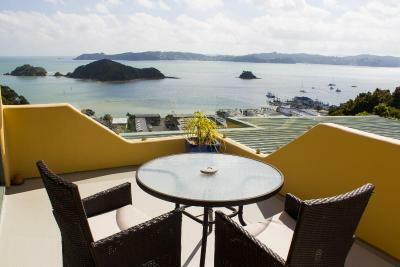 뀐 Located in the top-rated area in Paihia, this property has an excellent location score of 9.8! When would you like to stay at Allegra House? 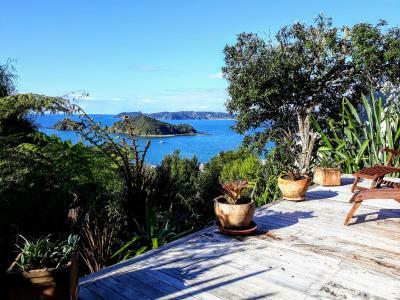 This studio features spectacular views out to sea. 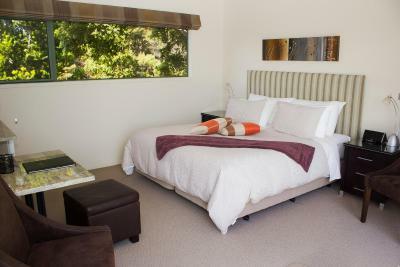 The spacious room has modern furnishings and a queen size bed. 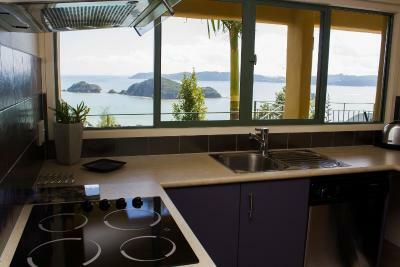 There are tea and coffee making facilities and breakfast is included and served on the first floor, looking out to sea. 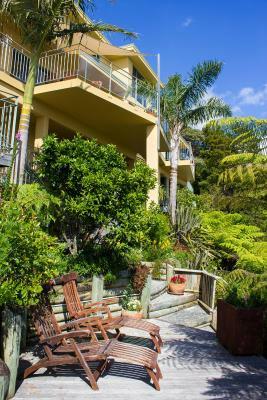 Located upstairs on the 1st floor, this larger, modern studio features a balcony offering stunning sea and bush views. It has a super-king sized bed with a duvet. 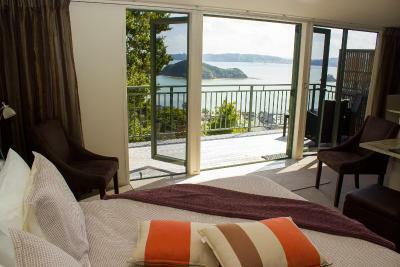 It can be split into 2 single beds, on request at time of booking. It includes a flat-screen TV, a refrigerator and tea/coffee making facilities. Reverse-cycle air-conditioning is provided. 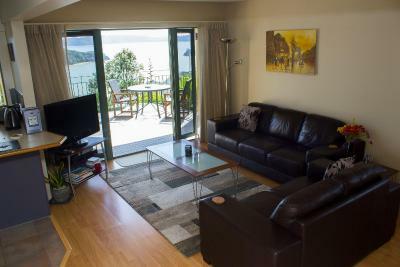 The open plan living area has a leather lounge suite, dining table, full kitchen with oven, cooktop, microwave, dishwasher and plenty of utensils. 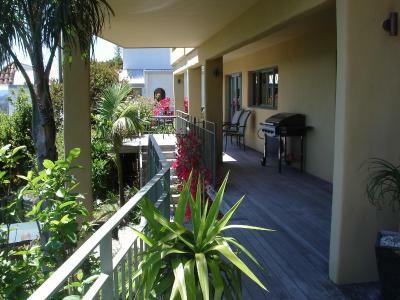 The room opens onto a covered balcony with views out to sea and plenty of space to relax and eat. 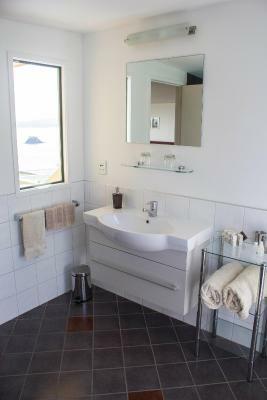 The bathroom is accessible from both the lounge and bedroom. There is room to have a single bed set up, on request, in this area for a third person or for separate sleeping area for two people. Breakfast is not included in the room rate but is an optional extra that you can request either at time of booking, using the special request box or on arrival. We have 4 rooms for guests but also live here ourselves. 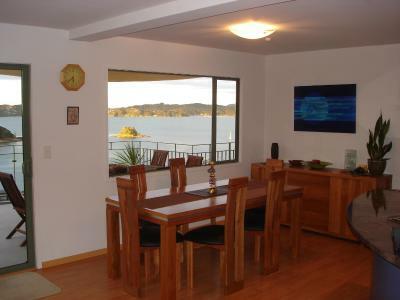 We are located just up the hill from the centre of Paihia with stunning views and a quiet location. 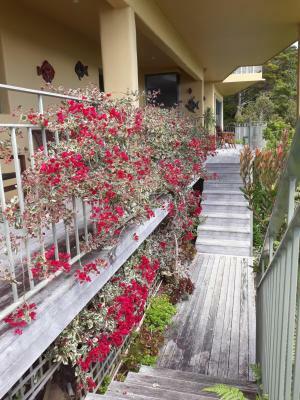 Many guests walk down to town through the bush and are happy with the steepish walk back up. If you are arriving by public transport - do let us know so that we can come and pick you up from the bus stop. From the airport you can take Super Shuttle that meets each flight. House Rules Allegra House takes special requests – add in the next step! Allegra House accepts these cards and reserves the right to temporarily hold an amount prior to arrival. Please note that if you are arriving by bus, a pick up service from the bust stop is available, on request. To request this service, please use the special request box when booking or contact the property using the contact details found on the booking confirmation. Please inform Allegra House of your expected arrival time in advance. You can use the Special Requests box when booking, or contact the property directly using the contact details in your confirmation. Had expected the B&B to be a little closer to the town based on the description, but once we appreciated that there was a path, somewhat steep, that took us quickly to town, that was OK.
Everything! Our hosts were lovely, amazing views and great breakfast. 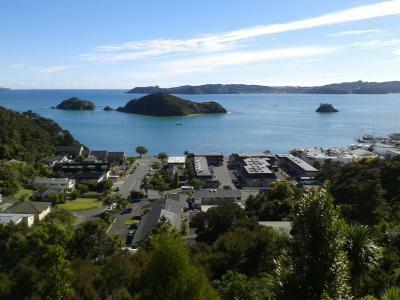 If we ever return to Bay of Islands, we would stay here again. The bed was very comfy e.g very good pillows. Views were great. Netflix was good! The view from the room is spectacular, the breakfast was great. Close to town where you could walk from the house and leave the car behind. 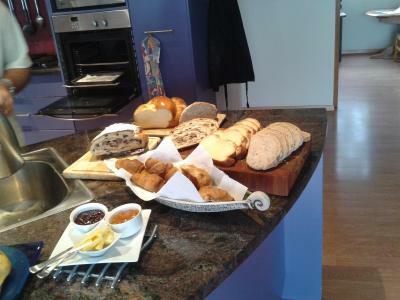 The location is one of the best of any BNB's we have frequented! 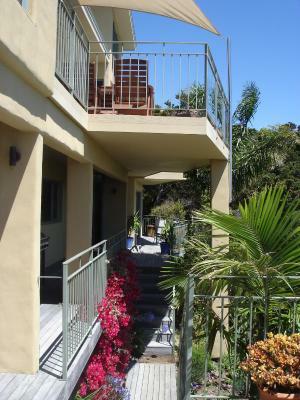 It was at the top of a hill and had amazing views from anywhere you stood on the patio deck and especially from our queen studio room. 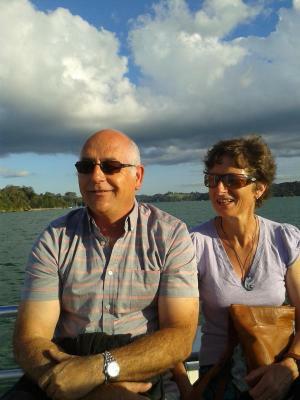 The hosts were most welcoming, and helpful providing us with suggestions of activities to do, local sights to take in and even loaned my husband (who is a birder) binoculars to further explore NZ bird species living on the island. Enjoyed the nice personal touches such as the fresh flowers in our room, coffee, tea, milk, cookies, and the robes and slippers. While the place was filled with other guests, we never heard them and we enjoyed the peace and tranquility that surrounded us! The owners even provide the option of an easy short walking trail on their property that takes you down towards the town center which was a favorite feature of mine! The breakfast selection included so many items to choose from. Our favorites were the fruits, cereals, meats, cheeses, homemade breads, jams, honey, juices, tea, coffee and eggs cooked to order! It was a pleasure meeting other guests each morning at breakfast who were from all over the world! Super experience. Would stay there again! 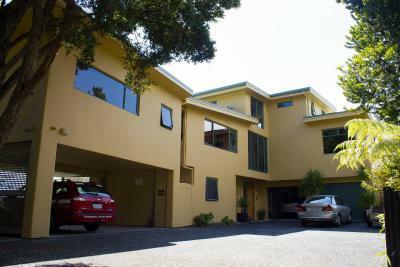 The property lies at the top of a very steep hill. There is a short cut through some vegetation but this resulted in more than a few bites. You really need a car to get from the town at the bottom of the steep road to the property or if your fit then walking up will be no problem. The view from our room and the facilities. Both Heinz and Brita were excellent hosts and provided us with plenty of information. Our stay was not long enough. Allegra House truly exceeded our expectations. 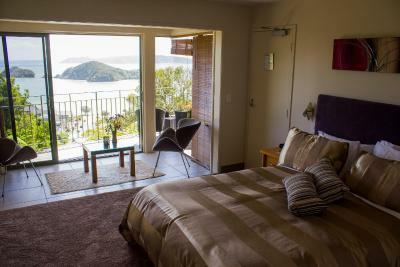 From the moment we arrived we felt very welcome, our room was awesome and the view was absolutely fantastic. We could not have asked for more 👌 we have already recommended Allegra to friends 🙂👍Breakfast was superb,a great way to start those too few days in the Bay. Bed was awesome...food was great and the views were unbelievable....staff were awesome..